Trinity College Dublin had to convince Burger King that its trademark for “BK Merchandise” was about selling prints from the Book of Kells, not hamburgers and chicken fries. 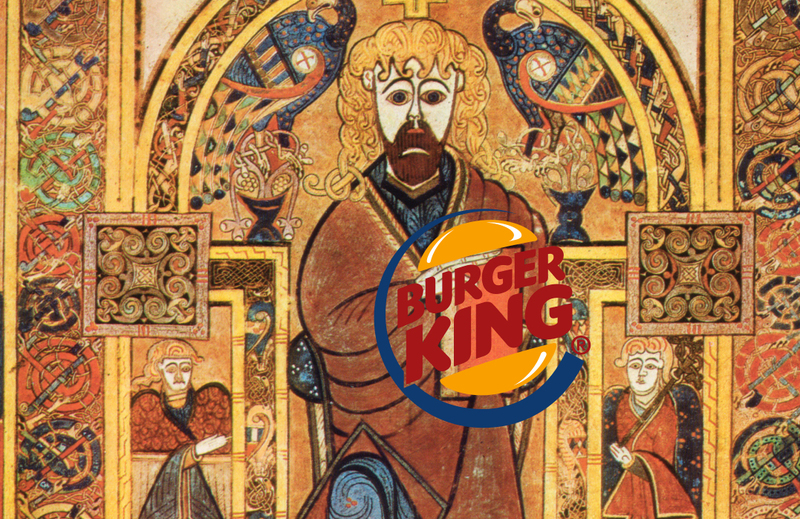 While Burger King might be technically older than McDonald’s Corp., it’s certainly not older than the Book of Kells, a 9th Century illuminated manuscript of the New Testament Gospels. But when Trinity College Dublin tried to trademark the Book of Kells name and related “BK merchandise,” Burger King’s legal eagles objected, claiming it would infringe on the fast-food giant’s marks. Trinity College was attempting to register a global trademark for the famed manuscript, which was created around 800 CE, so that it could raise funds to preserve the school’s collection of rare books. The university is working with UK publisher Thames & Hudson to create products based on the illustrations in the Book of Kells, which has been held at Trinity’s Old Library for more than 60 years. But when the trademark application came up in the U.S., Burger King objected because of the use of the letters “BK,” even though there was no intention of printing outtakes from the Book of Kells of burger buns or soda cups. Two companies can trademark the same names, so long as their is minimal chance for confusion that the two marks might represent only one company. The school tells the Independent that it was it was eventually able to convince Burger King to back down from the trademark challenge — because it was being ridiculous. “Eventually, they understood that Trinity College was not interested in the fast-food business,” a rep for the school explains.